The Master of Magnetism embarks on a holy crusade to rescue his fellow mutants from the coming genetic conflagration with humanity... regardless of the cost to either side. The newly formed Acolytes, Magneto's disciples, see him as their greatest salvation. Little do they realize their zeal will carry them to the ends of earth - and above - when Magneto proclaims Asteroid M a haven for mutants everywhere, inciting a state of war between himself and the world's great powers! All that stands in the way of absolute chaos are the mutant heroes known as the X-Men, whose powers and abilities set them apart from a humanity that hates and fears them. Collects X-Men (1991) 1-7. Back in the heyday of comics in the early 90s, there wasn't a much more anticipated book release than that of X-Men #1. Jim Lee and Chris Claremont had already made their mark on Uncanny X-Men and Marvel decided that it was time to set them up on their own series, the new adjective-less X-Men. At that time, it was the highest selling comic in history, and it may still hold that title. Everybody wanted this issue, me included. So, how does it hold up nearly twenty years later? Not too bad, actually. Some of the story points in this collected edition are still relevant in today's stories. The writing, while a little inflated (a Chris Claremont trademark), is still good and Claremont did a great job of making Magneto relevant as a character again in just three issues. The art is superb, but I might be a little biased as I've been a huge Jim Lee fan since he took the art reigns on Uncanny X-Men. Even after all this time, I'm still in awe of his artwork. 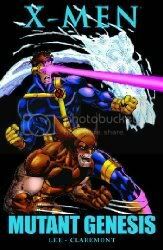 The X-Men decided to split their group up into two teams, the Blue Squad and the Gold Squad. Ideally, this was supposed to split the group up also into the two titles, The Blue Squad in X-Men, the Gold in Uncanny. If memory serves, this proved as a relatively reliable way to split the characters up between the two books, but eventually they starting spilling over back and forth between series. The series begins with the two squads testing out the defense systems of the mansion where they live. They are quickly embroiled in a battle with Magneto after he proclaims his Asteroid M a safe haven for all mutants, and he steals some nuclear missiles from a sunken Russian submarine to put into orbit around Asteroid M as protection. When one of these missiles is detonated in the atmosphere after a battle, the leaders of the world proclaim war on Magneto. Some of the X-Men are captured by Magneto and it's up to the other members of the team to rescue them before Asteroid M is destroyed. At the time, I really remember this being an amazing story, and reading it for the first time in twenty years, it really held my attention well. The subsequent story arc dealt with more of Wolverine's past, and it was a good story, but honestly, exactly how much mysterious past can one character have? The threads of this story arc, however, were key to several plot points later on in the X-Men series, and these were great places to start revealing these threads. Overall, not quite as gripping as the first story arc in this collection, but a good read all the same. If you're a fan of the X-Men, I'd highly recommend this book. If you're a casual reader, the finer points of the characters histories may be lost on you, but I still think this is a great story.